Publication issued with the authority of a state and containing aeronautical information of a lasting character essential to air navigation. We are offering basic training on gliders or on motor aircrafts with the opportunity to obtain the license of private pilot (PPL-A). Do you want to see beauties of Šumava and its neighbourhood? Then we advise you to visit our Aero Club and to try either introduction flight or to order foto flight with our own aircraft Zlin 43. The right place for refreshment or for evening fun with an excellent dinner and nicely spent time with your friends, you find in our restaurant in the style of Jack Daniel´s, which is placed just at the airport. Klatovy airport has the status of Public international airport since 1994. Since 1992 is used and managed by Civic association named Pošumavský Aeroklub Klatovy (PaK), which actually register 100 regular members. PaK is following reach and long term history of aeronautical history in Klatovy region. The activity of PaK is focused on three main sporty activities and sections of flying – gliding (the biggest part of PaK), motor flying and skydiving section, which however face weak activities of its members. The main skydiving activities at the airport is provided by independent company Pink Aviation, which is using services of PaK. 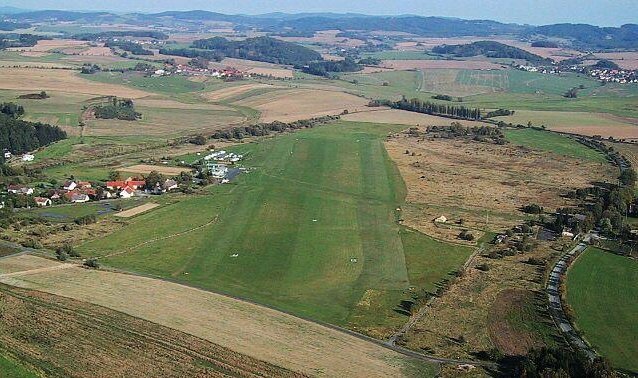 Our airport is often visited by not only by many pilots, including foreign ones (thanks to very attractive location after crossing Czech – German boarders), but also by visitors, tourists and all other flying enthusiasts, during our main flying season. During last season we have registered several thousands of aircrafts moving.